The photo is quite graphic as it shows the leftovers at the completion of the project. 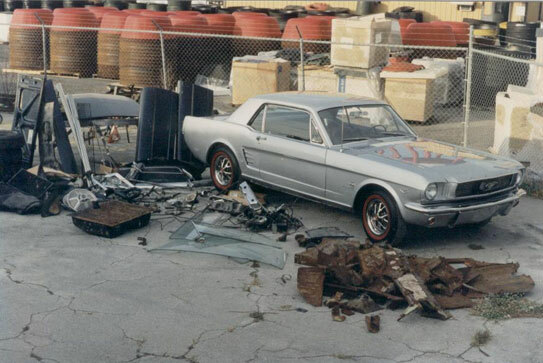 This Mustang was done many years before coming to our shop and had the need for a complete refurbishment. The existing paint job still had a hand print in the sail panel from the last painter pushing it out of the paint booth. After complete paint and rust removal, we found that it needed every thing from the toe boards back. Now in its correct color Silver Frost exterior and black interior with a fresh running solid lifter 270 HP, 289 V8 4BBL and 4 speed transmission this car is feeling good again on the road.